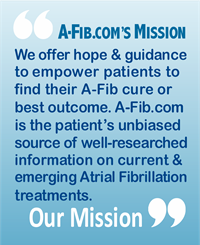 For A-Fib patients, we now have the promise of personal monitoring to detect atrial fibrillation. After working through a tedious FDA approval process, AliveCor’s KardiaBand™ for Apple Watch® is finally available (they’ve been promoting it since before October 2016). KardiaBand is similar in function to AliveCor’s Kardia Mobile, a small device which interfaces with smart phones to display and record ECGs. The KardiaBand is the first of its kind, FDA-cleared, clinical grade wearable ECG. It replaces your original Apple Watch wristband and provides access to a 30-second ECG anytime, anywhere. By placing your thumb on your wristwatch band, the KardiaBand for Apple Watch offers a medical grade single lead ECG recording. (The ECG recordings are equivalent in quality to those made by the Kardia Mobile.) You can record unlimited ECGs and email the readings to anyone. Your Apple Watch’s built-in heart rate sensor and accelerometer, when combined with the KardiaBand, uses Alivecor’s SmartRhythm™ monitoring with artificial intelligence models for tracking heart rate and activity data. SmartRhythm monitoring involves a deep neural network that runs directly on the Apple Watch, constantly acquiring data from the watch. When the network sees a pattern of heart rate and activity that it does not expect, it notifies you to take an ECG using the KardiaBand sensor. Or, any time you like, you can discretely take a 30-second ECG. The KardiaBand with SmartRhythm monitoring can instantly recognize Normal Sinus Rhythm, and check for Possible Atrial Fibrillation (AF). To learn more about how it works, go to Alivecor.com/technology. KardiaBand requires an Apple Watch and Kardia app. The KardiaBand is $199.00 and ships with two band lengths to assure a proper fit. 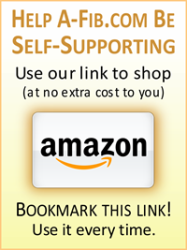 Includes free shipping and a 30-day money back guarantee. It’s available from the Alivecor website. The gold standard for diagnosis of atrial fibrillation (and other cardiac arrhythmias or abnormalities) is an electrocardiogram (ECG). Buyer’s Regret: With a 30-day money back guarantee on the KardiaBand and free 30-day membership trial, if not happy with your purchase, I suppose you can return it all and owe nothing. I found the most helpful online review is by Anthony Pearson, MD, at The Skeptical Cardiologist website (theskepticalcardiologist.com). See his article: Alivecor’s Kardia band is now available: Mobile ECG on your Apple Watch. Customer reviews of the AliveCor KardiaBand on Amazon.com are split; take a look. 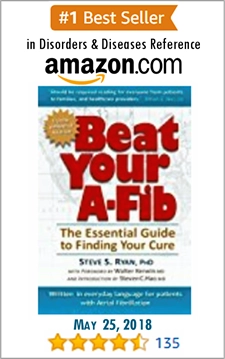 “When I would go into afib, I was highly symptomatic. 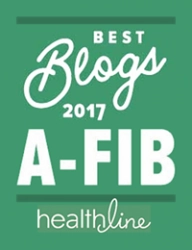 However, I always turned to my Kardia Mobile monitor to confirm I was indeed in afib before I would take my medication (Flecainide) as a pill-in-the-pocket approach to treating my atrial fibrillation. This is a very powerful antiarrhythmic drug, especially at the doses I was taking (300mg), so I didn’t want to take it unless I was absolutely sure I was in afib. I would then use the AliveCor monitor afterwards to confirm I was back in NSR. … It was great to have the monitor to confirm when the episode was over. Works for PVC/PACs too: Since his successful ablation back in March 2015, Travis hasn’t needed to use the Kardia Monitor for A-Fib specifically, but now uses it extensively in his battle with PVCs and PACs. He confirms his PVC/PACs and rules out A-Fib. He also uses the data to keep a historical record of the number of his PVC/PACs. To read Travis’ full review, see our article: AliveCor Kardia Update: Review by Travis Van Slooten. If you decide to invest in an AliveCor KardiaBand and Apple Watch, first determine your goals. Be realistic. It’s not a replacement for your doctor’s Event Monitor. 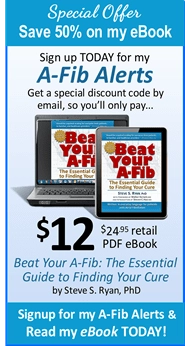 And the ECGs won’t help you avoid an A-Fib-related stroke. Using the KardiaBand and Apple Watch to email ECGs may help you communicate better with your doctor. 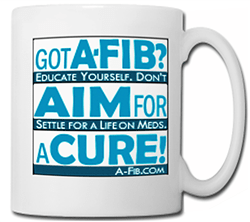 It may help to know if you are or are not having A-Fib attack. It may help you remain calm and give you peace of mind. Remember: A KardiaBand on an Apple Watch is just another tool in your A-Fib “toolbox” that can help you cope with your A-Fib. VIDEO: Here’s a short video that shows you the basics of using the KardiaBand with your Apple Watch. Posted by AliveCor, Inc. Length: 51 seconds.